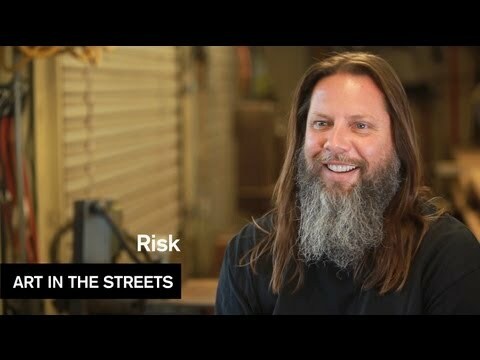 MocaTV’s art channel recently documented legendary Los Angeles graffiti artist RISK and his inspiring mural project to brighten up one of Downtown’s bleakest neighborhoods. The mural continues the evolution of our friend Daniel Lahoda’s LA Freewalls Project, who teamed with the Skid Row Housing Trust to bring large-scale public art to the streets of Downtown LA. Selecting the artist to create the mural was a no-brainer. RISK earned his legendary status writing graffiti over the past thirty years, leading the evolution of graffiti as a respected art form in Los Angeles and worldwide. Now as a father of four, RISK explains, he feels compelled to consider the message behind his art and its influence on the surrounding community. RISK spent five days transforming the overlooked corner of 6th and Alameda into a canvas that is now bright enough to be seen from an aerial view of the city. The mural, titled “Ye Sun,” features vibrant, oversized rays that injects feelings of optimism back into the streets and inspires Skid Row with a new dawn. Director Todd Mazer documented the transformative process for MocaTV’s “Art in the Streets” series.